(Source) “The federal government shutdown could leave America’s craft brewers with a serious hangover. You see that quote above me? That’s a quote from one of the founding fathers of these here United States. Now if politicians want to make everyone angry and depressed and shut down the government that’s fine. How do Americans cope with anger and depression? 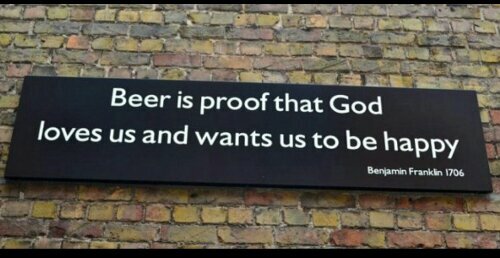 We drink beer. Now you’re trying to tell me these same politicians are trying to take away our beer? Now you’ve gone and messed around with the wrong portion of the population. Shutting down the national parks? Fine, most national parks employees are 100 years old. Shutting down the chemical safety and hazard investigation board? Kind of disturbing but fine, we’ll deal with it. But when you mess with beer, you’re dealing with a lot of unstable people, including myself. Drinking beer keeps our dreams alive. Maybe we didn’t become professional athletes, or race car drivers or astronauts. But we wake up everyday and go to work, then we come home, buy some beer and keep the economy moving forward. You take people like me and Matt out of the equation and society itself will crumble. Shut down the government. Shut up the government. I could care less. Just keep your greasy paws off my beer. Posted on October 10, 2013, in Average Blog Posts and tagged alcohol, beer, craft, government, shutdown. Bookmark the permalink. Leave a comment.